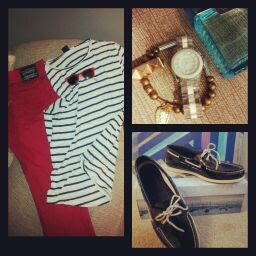 Red slim jeans/ quarter sleeve cotton tee/ white Marc Jacobs timepiece with gold accessories/ raybans/ patent black sperrys. Darnell posted this pic on instagram after reading [TREND WEEK] Day 1: Men's Nautical Fashion. Follow him on instagram @mister_dapper and if you get inspired by a blog post feel free to reach us and we will give you a shout out! Thanks for reading!